Small set of ruins and rocky elements. The set contains two different unpainted resin elements. Fantasy aesthetic scenery elements designed for Nemesis gaming tables and suitable for any other fantasy 28-30mm miniature war game. Scenery elements designed for Nemesis gaming tables and suitable for any other fantasy 28-30mm miniature war game. 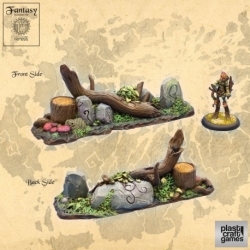 The Forest Obstacles pack contains two different unpainted resin pieces.